Was Luke the Evangelist also an artist? The detail image shown above is from a stained glass window in Dublin's Christ Church Cathedral. It is in the Chapel of Laurence O'Toole and shows St Luke drawing or painting. It was created by Patrick Pollen in memory of his teacher Catherine O'Brien who died in 1963. 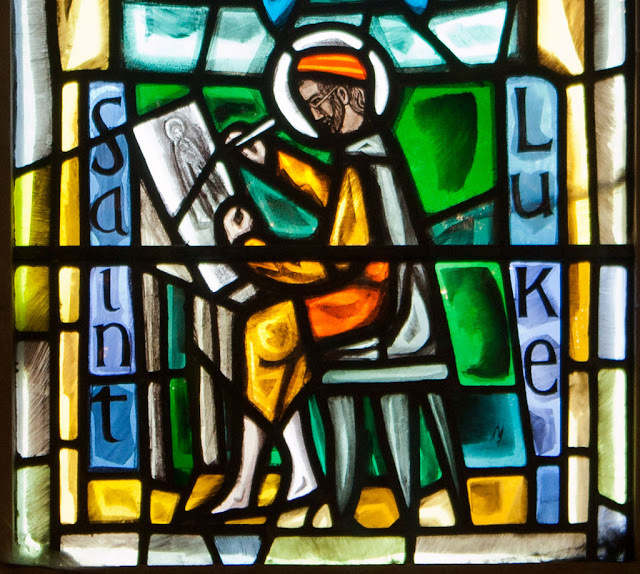 Some people venerate St Luke as the patron saint of artists. This is because of a Christian tradition from the 8th century onward that Luke painted the first Icons of the Virgin Mary and Jesus. There are legends supporting this idea and paintings showing Luke painting the Madonna and Child, for example this anonymous Russian icon.